I need to confess, the raw fleece and cow hair iPad cover I felted the other day was not a success, in fact, I could go so far as to say it was a big disaster!!! 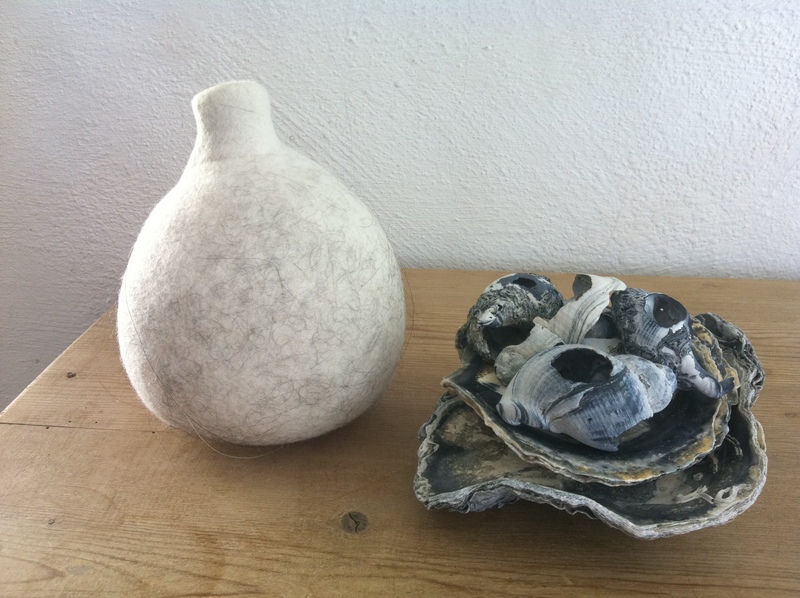 Cow hair is very slippery and likes to protrude through the layers of wool in any project, I did know this from previous experience and was happy to use it to my advantage in the little vessel pictured. What I did for this narrow mouthed vessel was lay the hair against my plastic resist, encase everything in several layers of lamb’s wool then felt them together. The hair worked its way through to the outside during the felting process and ended up as an interesting surface detail, I love this piece. For some lunatic reason however I decided to include cow hair in the iPad cover even though I was able to predict a hairy interior, stupid! I loved the idea of raw fleece and cow hair combined but unfortunately the resultant felt is shedding like crazy both on the outside and the inside of the cover. The soap I used, the felting net, the utility room and my kitchen are covered in loose strands of the hair days later, you know by now how much I HATE cleaning and tidying so you can imagine how thrilled that makes me feel! 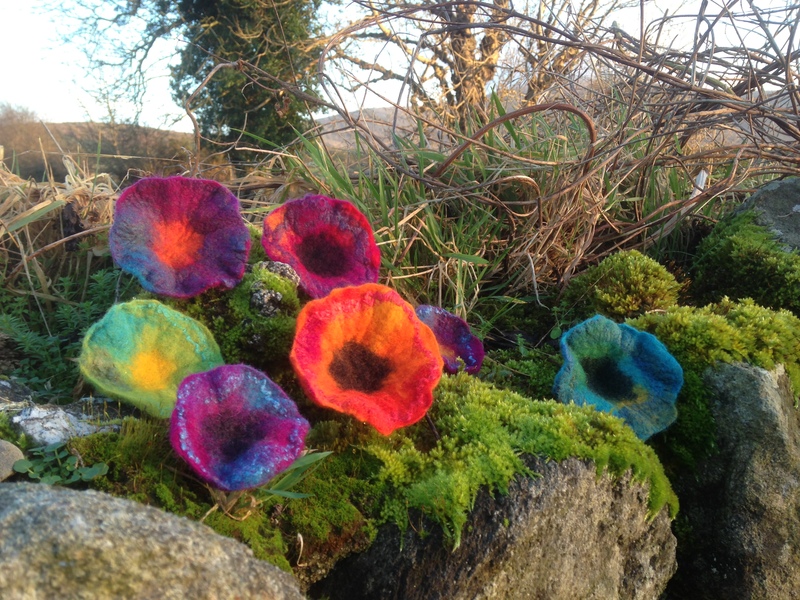 Anyway, yesterday I knuckled down to felt 23 flowers with ring backs with a lot more success, these are multi functional acting as colourful scarf closures and are also one of the components of my flower bolo. The flower bolo has proved to be a best seller since I came up with the design prior to my trip to the wonderful Tin Thimble last September. It may be worn in several different ways and as all my stock of them sold in the run up to Christmas I decided to felt more for both the studio and design shop at Duckett’s Grove when we reopen the first weekend in February. It was really nice to work with bright, cheery colours for the flowers and I’ve continued this theme today while working on some nuno felt, pics tomorrow, weather permitting. Finally for today, I just wanted to let you all know some important information regarding ‘Nuno Felting by Chrissie Day and Nicola Brown’. Due to circumstances beyond my control I regret that from this point forwards purchasers will no longer be able to get a free set of templates for Chrissie’s designs when they order the book. This was a unilateral descision taken by Chrissie, she is however making them available from her at an additional cost of £2.50 per template. This entry was posted in Book, Book with Chrissie, Felt and tagged Felt, felt flowers, felt iPad cover, felting with cow hair, Nuno, nuno felting, nuno felting book by Nicola. Bookmark the permalink. I am so glad I purchased the e-book when it came out and already have the templates for the designs. It was always my intention to only give the free gift of templates for a limited amount of time on my designs in the book sold by Blurb. The templates are a very fair price of £2.50 each,cheaper than a sewing pattern. It was a decision taken by me when I published Nuno Felt,this was a free gift on the Blurb book only until the end of 2012. The picture of your flowers outside on things that are green makes me wish I lived somewhere else today, last night it got down to -39 C and that is cold. It is supposed to be a balmy -31 C later today but it is going to be a lovely sunny day once the sun actually comes up at 9:56 and before it sets at 15:34. But that does give me lots of time to spend indoors making felt as I don’t want to spend a lot of time outside. Those are lovely flowers and I think I will make sure that I do not use cow hair in any of my creations. Love the vase! Also to learn how you make what is bought, if that makes any sense.